Teamup Calendar supports event reminders. Event reminders alert calendar users of upcoming events. Reminders are sent at a specified time before an event starts. Currently, reminders are delivered by email only. This is a new feature. Your feedback to support@teamup.com is welcome. Please note that the event reminders are only available for users who are logged into their Teamup account. They are not supported yet on the mobile apps therefore can only be set up in desktop or mobile Web browsers. You can set up reminders for single events in the event editor or viewer. Make sure you are logged onto your Teamup account. Open your calendar and click on an event to open the Event Editor (or the Event Viewer if you have read-only access). In the Event Editor or Viewer, click Reminders to open the reminder dialog as shown below. Add one or more reminders and specify when you want the reminder to be sent. Click Done, then Save your changes. Choose the number of minutes, hours, or days before the event you want the reminder to be sent. If you want to be alerted for all events on certain sub-calendars, adding reminders event by event can be tedious. In this case, you can set up a reminder for all events on those sub-calendars. This can be done in the Preferences Dialog. Make sure you are logged into your Teamup account. 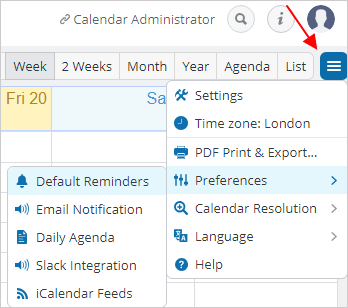 Open your calendar and click on the blue menu button in the top right corner of your calendar. Select Preferences, then Default Reminders. Choose Default Reminders to set up a sub-calendar event reminder. In the Reminders screen, click on the Edit icon (it looks like a pencil) for the desired sub-calendar. 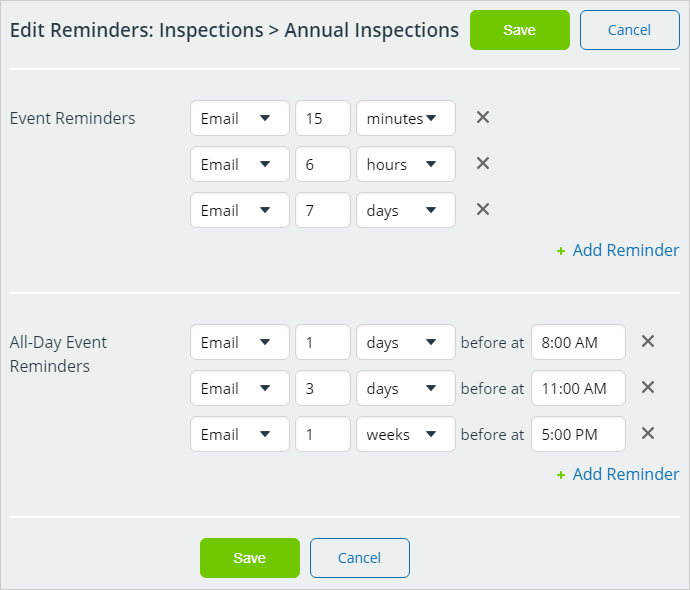 Add one or multiple reminders and specify how much in advance you’d like to be alerted. These reminders will be enabled for all current and future events on that sub-calendar. Please note that reminders for time-specific events and all-day events need to be specified separately. As you can see in the screenshot below, the Event Reminders section sets reminders for time-specific events, and the section below it, All-Day Event Reminders, sets reminders for all-day events. Click Save to complete the process. Reminders are currently only supported on the web calendar. Support for reminders on mobile apps will be added in the future. Currently, reminders are delivered by email only. More delivery options will be added in the future. 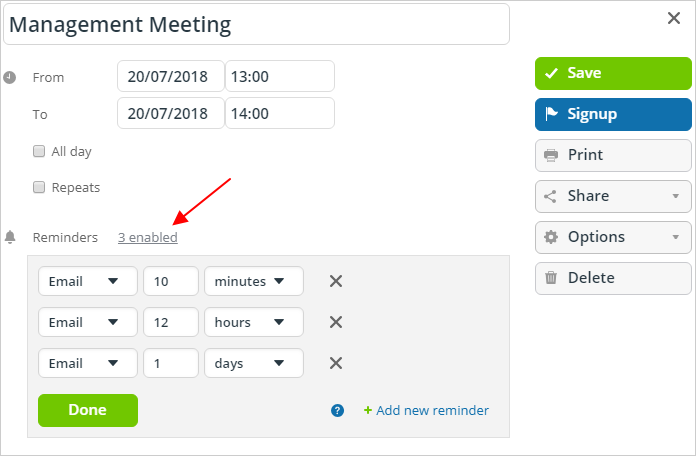 To work around the current lack of support for mobile push notifications, you may like to consider this approach: Subscribe to your Teamup Calendar from another calendar application, for example, Apple iCal, Google Calendar or Outlook. Then, enable reminders for the subscribed calendar in that third-party application. An alternative to reminders is the Daily Agenda feature, which is an email sent every morning that lists all the events for the current day. Read more. © Teamup Solutions AG. All rights reserved.